Once you start an interest in megalithic remains and then start to research a photographic gazetteer of the sites that you visit, you find that every large gatepost and many hedge markers start to stand out as being from part of a dolmen or circle. In the higher parishes where the bedrock is redder, the grey smoothed stones really do give themselves away. If you cannot recognise these just at the moment I recommend visiting this area and taking it in. 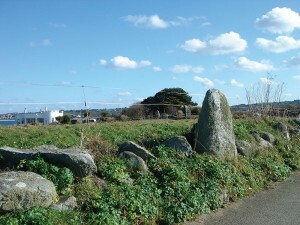 All that exists, of what was in all likeliness a very large site, are two menhirs, magnificent sentries over what was described by Mr. George Mètivier in a letter to F. C. Lukis (now in Guernsey Museum as part of the Lukis collection) as a large circle of stones which was paved with a floor of flat stones. One can only imagine what a visitor 4-5000 years ago would have seen! The two menhirs, La Longue Pierre 3m high, and Le Crocq 2.1m high, seem to stand on an east-west line, though from another angle we can take in three menhirs that suggest that they could be making up part of a huge stone circle. 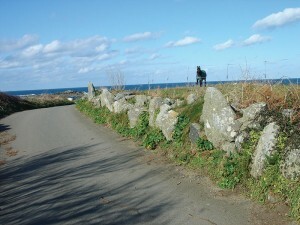 The two menhirs are on private land but can be clearly seen from the road. There is a small car park at the end of the headland where one can enjoy the views of La Catioroc and Lihou headland, home of the Creux ès Fees. If you walk to the end of the car park where it meets the beach, one can see the flint chippings and old deposits like the ancient shell ‘midden’ (refuse heap) pictured at the top of this page as the ground is being eroded away. 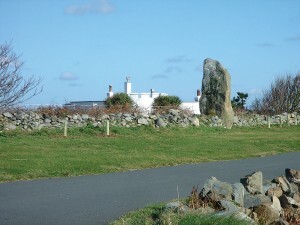 Le Crocq, the smaller of the two standing stones, was re-erected by the Ancient Monuments Committee in the summer of 1955. It was noted at the time for ‘protuberances’ running up and around its sides, though this is probably natural weathering as no further comment has been made by the experts. There are lots and lots of shaped stones, some of them very large that could be standing stones from a large circle.